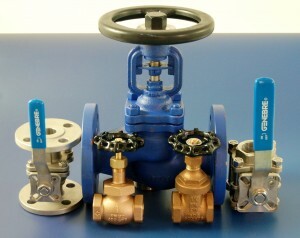 Besseges (Valves, Tubes & Fittings) Ltd have reached a milestone as a TLV steam products distributor. We became an Authorised TLV steam products distributor in 1999, in the year where according to many we were heading for millennium disaster. As it turned out this became a poignant moment in the history of our business and its staff. It is the year we started our transformation from being a valve and pipeline supplier to be a specialist in process steam products. Training led to increased product knowledge and understanding which took us out of the works stores and into the factories. Then over the coming years, experience allowed us greater involvement in process steam, working with contractors and end users. We are very proud of our track record in steam distribution having made changes on many sites that have improved production outcomes; and seen reductions in energy costs. Our remit as a supplier is as it should be, to satisfy customer requirements in the most economical and efficient way possible. We aren’t by any stretch of the imagination designers of steam systems; but we do have the know how and understanding to offer advice on many aspects of process steam. 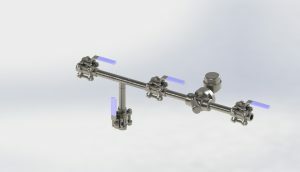 Quick trap sets for the installation of dirt pockets on process steam lines can be seen as an expensive option. If you look at the quick trap systems available presently you can see why it looks that way. Consider that one major UK manufacture recently quoted (March 2019) almost £900 for multiple quick trap systems with double block and bleed; and that price didn’t include the steam trap. Here at Besseges (Valves, Tubes & Fittings) Ltd we felt that there is a gap in the market for a reasonably priced fabricated version of quick trap systems. Not far from my home and of course Besseges (Valves, Tubes and Fittings) Ltd is one of the best ways of enjoying walking in Ashton under Lyne. In days gone by there was once a railway track that ran from Ashton under Lyne to Oldham; via Park Bridge Iron and Steel Works. This particular Branch line serviced Oldham Road railway Station on the Oldham, Ashton and Guide Bridge Railway. The Line ran from London Road Manchester (Piccadilly) via Guide Bridge to Clegg Street Oldham. 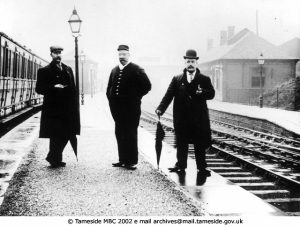 The line was fully open in 1861 and even serviced Ashton Moss railway Station which closed a year later in 1862. This railway branch line was open to passengers till 1959 and closed completely in 1967 as a goods line. I had a conversation with a local man several years ago and he told me how as a child in the 1950s he stood on the exit to the tunnel on Turner Lane. Him and his friends used to drop the class pop bottles into the steam locomotive chimney and watch them blast back out with a bang. I am certain that this would have been frowned upon then and be viewed a criminal now; but am also certain that it was done in complete innocence. Having now written around 200 Blogs on the subjects associated with a valves tubes and fittings supplier; I have to say I cannot be sure that the task can take anymore material. We are an amazing business with excellent staff and a forward looking management team. I am very proud to be part of that management team having been part of the process that has grown our business into what it is today. The truth is though, what makes our company the excellent business that it is; are all the people that are Besseges (Valves, Tubes & Fittings) Ltd.
For many years local businesses were bombarded by Tameside Metropolitan Borough Council with meetings and forums with Carillion. 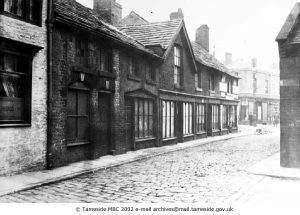 Our business when the constructor first appeared in Tameside attended many of these meetings and get togethers. 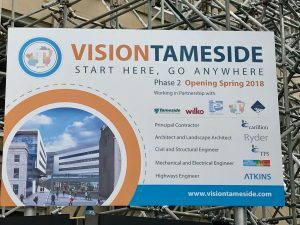 So that we could as a Tameside merchant supply for future projects in the Borough; and prosper from this new investment in Schools and other public buildings. The story though was all to familiar for many local companies, the promise land of supplying Carillion contractors was a dud. The reward for hours and hours of meetings and putting together quotes was a paltry £1200 worth of orders for our business. The reason behind this was the fact that the goal post were constantly being moved. We were told initially that to supply for these new contracts; suppliers needed to be within a ten mile radius of the borough of Tameside. With the end of a conflict that shattered Europe and the World, came the aftermath of such a monumental event. Local Industry here in Ashton-under-Lyne and beyond that had worked to feed the war effort with goods for soldiers and fighting; had the unenviable task of changing back to peace time manufacturing. Ashton-under-Lyne having already paid a high price just over a year earlier with the explosive’s factory accident killing and maiming so many of its residents. Add to this the fact that 1514 of its young men never came home and their loss scarred the town for decades after. There cannot have been a single family in Ashton that wasn’t affected by the tragedy and heartbreak of war on a monumental scale. Besseges (Valves, Tubes & Fittings) Ltd are a Manchester pipeline supplier based just outside the City; close to Junction 23 of the M60. We have operated for just over thirty years, under a management team which has been here almost from the start. The current Managing Director just celebrated a thirtieth anniversary with the business, with her support team following closely behind with over twenty nine years each. This continuity with the management team and our staff are what’s made our business a successful Manchester pipeline supplier. Besseges (Valves, Tubes & Fittings) Ltd opened its doors as a Manchester pipeline supplier on the 1st October 1988 with only the present MD and two others. Our warehouse and trade counter were a small part of James Howe Mill, Ashton under Lyne. The same space presently holds our stock of welding fittings and some of our valve stock; the tube wrack was in the mill yard. Thirty years have changed our business beyond all recognition; two warehouses are barely large enough to hold the stock required. Three people are now seventeen including our directors, which is likely to become eighteen in the coming months; to read more about our business, carry on reading this Blog. Unexpectedly in July 2012 I became a Blogger, the original idea being that working with my colleagues; I would write one in five of our Website Blogs. We were given some pointers on what to write and what kind of content should be covered so we could improve our Search Engine Optimisation. That lasted for five Blogs and after five whole weeks, the Blogs became my sole responsibility and the story of my commercial blogging began. What was missing in the beginning was not about what to write as we had an entire product range to talk about. The thing that was missing in the beginning and for all I know it could still be missing now. Is the how of writing them, last time I had written anything meaningful that resembled a Blog was for O Level English and they were called essays; in the 1970s nobody had any concept of what a Blog was or even a Website. 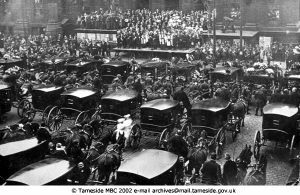 By 1918 Ashton under Lyne had lost over 1500 men in The Great War, each life lost is its own tragedy. Families lost Fathers, Sons, Husbands and Brothers in a terrible conflict that was named the war to end all wars by the author H G Wells. As it turned out the human race have not shaken off its capacity for conflict even a century later. The War Memorial in Ashton under Lyne has a total of 1814 names forged in bronze, 1514 of those names died in World War One; nearly 3.5% of the total population at the time. But if you compare the 1911 census with the 1921 census; Ashton under Lyne lost around 15% of its male population who were of a fighting age. 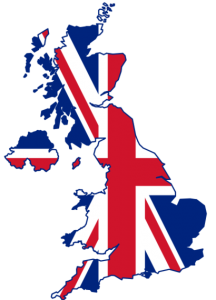 I hope this year that all that can, attend the laying of the Wreaths across the United Kingdom, to remember their fallen relatives. If you read our last Blog on the Great War, you will be aware that on the 21st March 1918 the German Army attacked British positions on Manchester Hill. This attack was the first of many between March and July 1918, the intension being a decisive set of operations to punch a hole in the allied trench lines. Despite making ground and winning some victories; the end result was little more than had been achieved by either side in so many futile attacks on embedded trench positions.